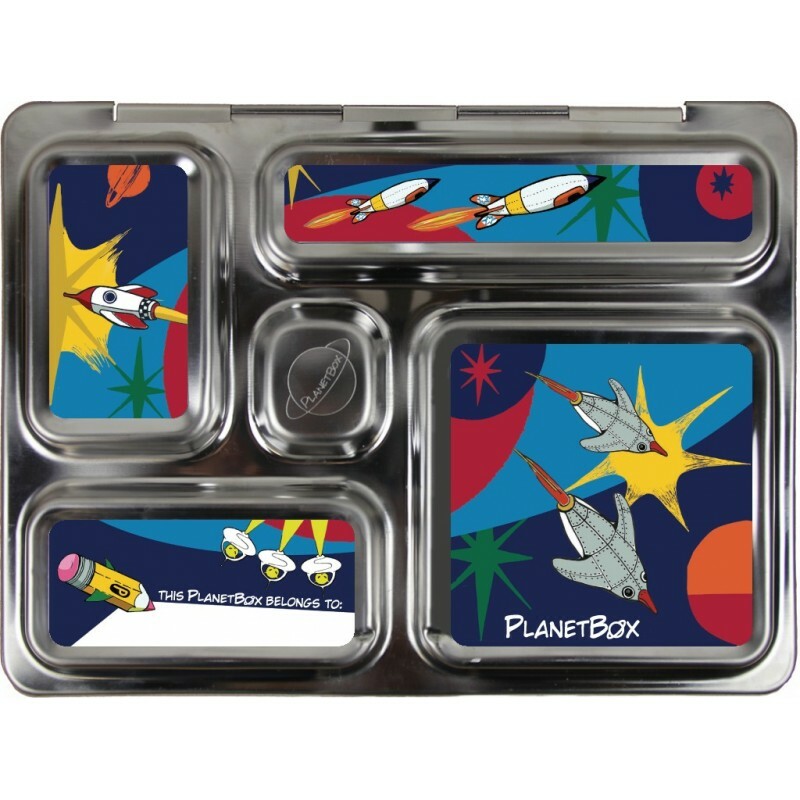 Launch off with rocket magnets with bento-style stainless steel lunch box, two leak-proof containers with new silicone lids, and a carry bag. Ice pack is not included. Choose your carry bag style from the drop down below. Buying this product = 118 Reward points for Members. Your cart will total 118 points = voucher of $5.90. Not a Member? Join at checkout to claim these points. A PlanetBox lunch box guides you in packing a well-balanced, litterless lunch. 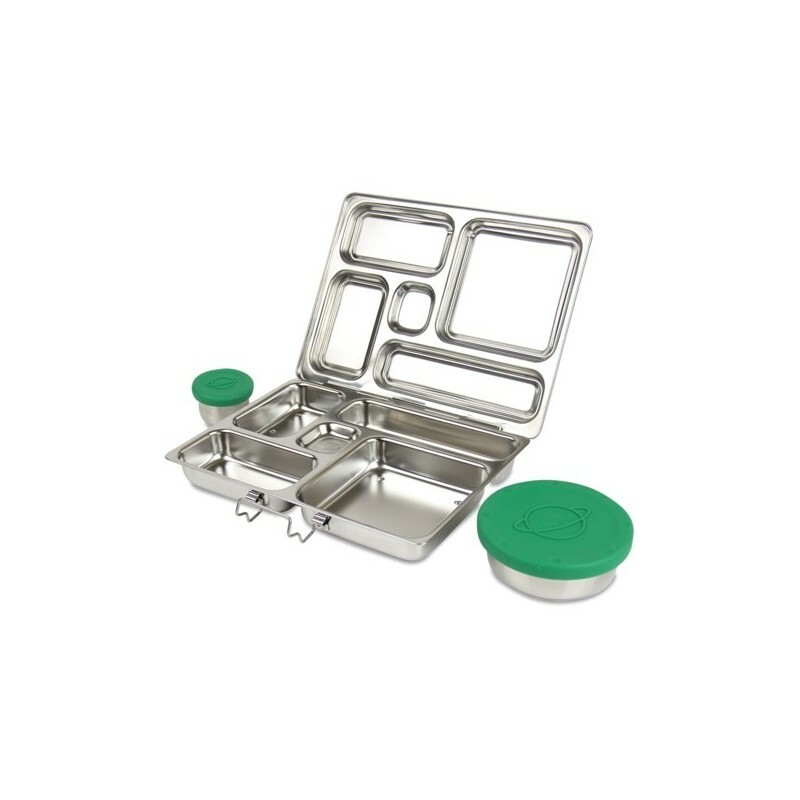 Bento-style, food safe stainless steel lunch box keeps most food separate (some small crumbs may transfer). While the top and the bottom meet to stop foods co-mingling, it is not leak-proof and not designed to hold wet, messy foods like yogurt and dip. The included leak-proof dippers are for such foods. Bag compilation image shows from top, left to right: Plaid Chequered; Purple; Black; Red; Pink; Blue; Nebula; Botanical; Dino Camo. Stainless steel is a non-leaching, non-toxic material for storing food. 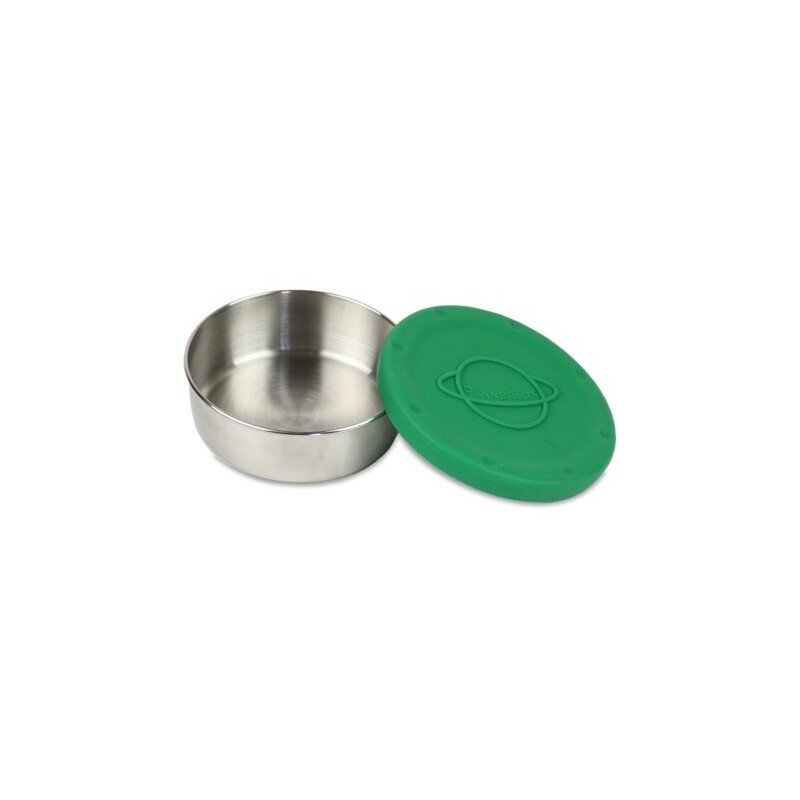 Kit includes a Rover Planetbox, magnets, carry bag for easy transport, plus one big and one little leak-proof stainless steel containers with green silicone lids ("dippers"). No lid to keep track of because it's attached. The PlanetBox is made of high quality 18/8 (300 SS) and 18/0 (400 SS, not 200 SS) stainless steel. It is food safe and will not leach toxic chemicals when in contact with food. Seals inside the dippers are made from silicone. Lunch box only is dishwasher safe. 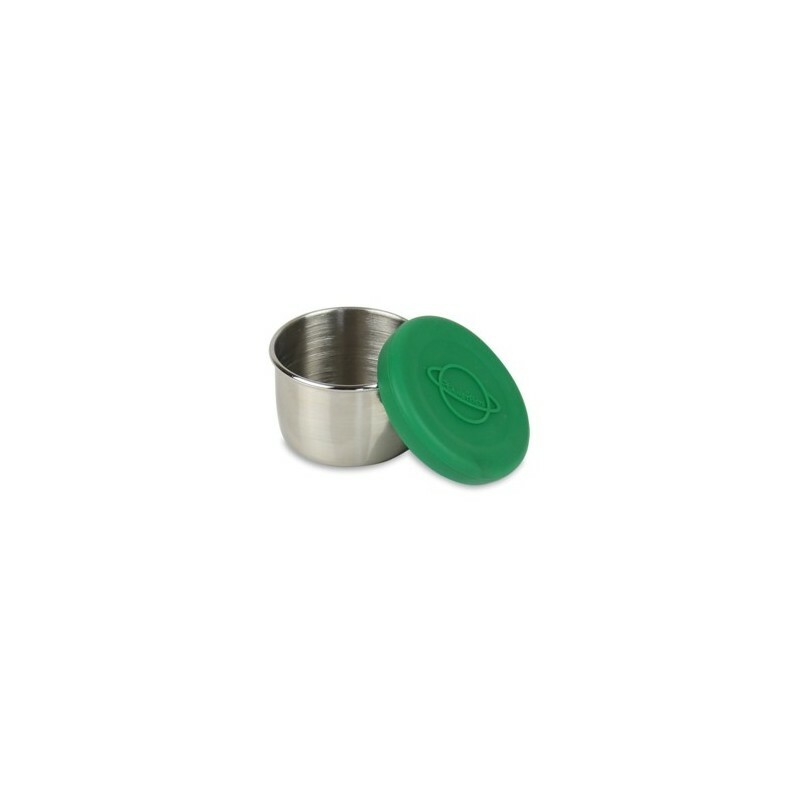 Independently certified to be safe from lead, phthalates, BPA, PVC, and other harmful chemicals. Made of durable, 100% recycled PET polyester fiber. Inner mesh pocket fits an ice pack to keep your foods cold. NEW bag: Outer material 100% recycled PET with PU coating. Inner material PET with TPU coating wipe down surface. dimensions: Planetbox 25cm × 19cm × 5cm. Carry bag 30cm × 22cm × 6cm. Shuttle: 3 compartments & 1 dipper container. Holds about 3 cups of food. Measures 19 cm x 12.5 cm x 5 cm. Rover: 5 compartments & 2 dipper containers. Holds about 4.5 cups of food. Measures 25 cm x 19 cm x 3.75 cm. Launch: 3 large compartments & 1 dipper. Holds nearly 6.5 cups of food. Measures 26 cm x 19.7 cm x 5 cm. 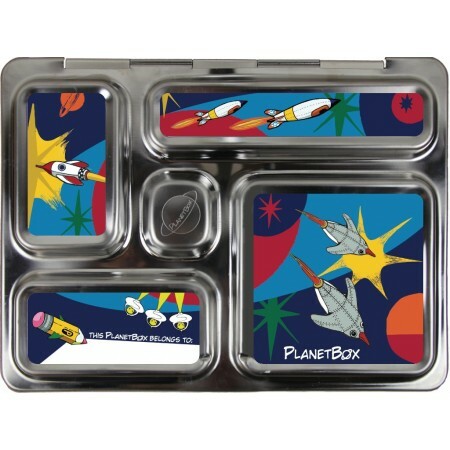 Browse the entire range of PlanetBox. Lunch box only is dishwasher safe. Please ensure magnets are removed and everything is completely dry before reapplying magnets. Hand wash bag (fully submerging bag in water is ok) and air dry. For some great advice on how to care for your Planetbox please see our Planetbox FAQ. Replacement parts: we offer replacement parts such as seals and magnets. Couldn't be happier... in fact I'm going to be ordering a 2nd lunch one very soon. Love the separate compartments which gives so many options for a healthy variety of foods and snacks. The price is high but the fact that these boxes have such a good reputation for lasting makes the price totally worth it. We just love our planet box! Yes, the initial outlay is quite pricey for a lunch box, but this is a serious lunch box. The stainless steel will last for years to come, so no more purchasing a new lunch box every school year. Due to the various compartments it eliminates the need for plastic or paper wraps and baggies. And while each individual compartment is not leak proof (though we've never had real issues with anything seeping between compartments, there are two containers that fit right inside that are for more messy foods like dips and yoghurt. The fact that it can all go in the dishwasher (except the silicone seals) means it's super easy to clean each night. These lunch boxes have completely changed the way we do lunch and I'll never go back. My 2 boys have been using their Rovers for 3 years and they are the best lunchbox! 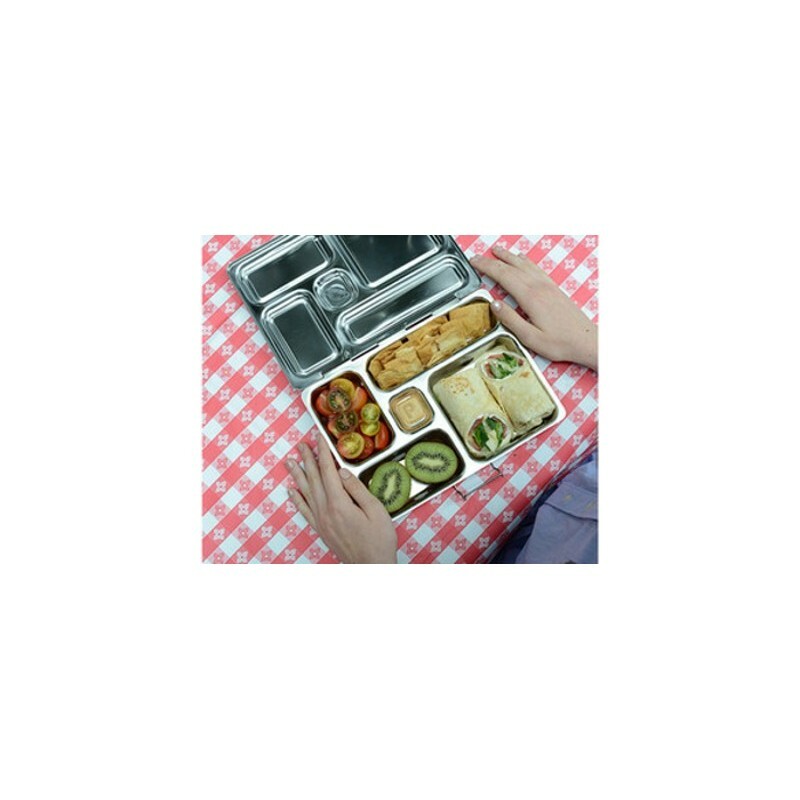 No waste/rubbish at school, great portion control, easy to clean and indestructible. The carry bag insulates beautifully and goes in the washing machine at the end of each term. Its still looking perfect 3yrs later! Best invention!